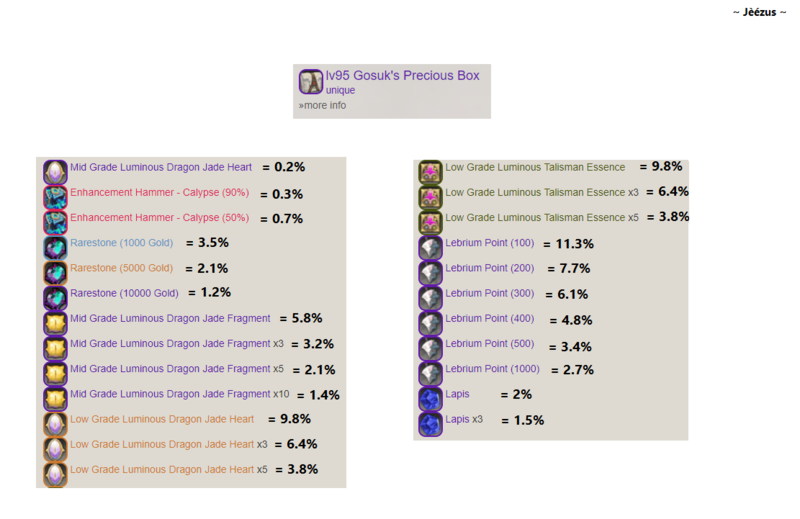 I wonder how good the golds-drops in it..
i sold off 30 boxes of gosuk precious box from someone in my guild, he actually got x4 rare stone (10,000) and a few other rarestones (1000 and 5000) and a few enhancement hammer ranging from 90% success rate and 50% success rate, he wasn't actually wishing to get a particular item he just wanted to try it out since he just returned from the game, he bought more boxes from me after that saying my boxes were "lucky"
i think the reason they removing that is because a lot of players in the game owns a lot of gold right now because of the rng value, 1.2% for a rarestone (10000) is high enough for most people to get it. yes i think that will be the reason... i even watched a video of luciaroyal from guiltyavenger while opening 115 boxes, he earned around 190k just from rare stone alone. That makes me interested and planned to buy the keys this month but after seeing the patch update, there's a possibility that i might pass buying the keys, keep the boxes in my stash and utilize the dnp reward in other cash items. Well I'm just glad Solver Store is here. And it's almost the same as DNKR's version. lmao dying game xD i open 115 boxes and yeah got 2x mid ♥ they didn't change the content but if that update is for March why put it in Feb patch note?? imma already playing other games but i can't find any good RPG this days so i stick with this game lol..
DN is not dying, you're overacting, game is still good as it is for most people, if it is dying as you believe how come you're still playing the game. you seem to have mistaken my comment as being "overreacting"
you mean most of the time.. also rewards are either delay or wrong reward..